This is a big one. On July 14th 2019 Udaka Tatsushige is going to perform the nō Dōjōji for the first time, making this one of his most important hiraki performances. Dōjōji is probably one of the most well-known plays in the repertory, telling the story of how a young woman who had been tricked into believing that a monk will marry her pursues him until she finds him hiding under a temple bell. Transfigured into a monstrous snake, the woman coiled around the bell and, spitting fire from her mouth, burnt him to death. 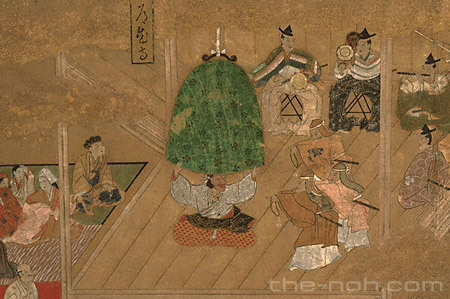 One of the most spectacular features of the play is the section in which the actor enacting the spirit of the woman reappearing at Dōjōji jumps into the bell (a 100kg heavy property) as it falls on the floor. Once inside the bell, the actor changes costume, wig and mask by himself, reappearing in the form of a demon as the bell is lifted. Dōjōji is the first nō performance I have ever seen live. It was 2007, and the actor was Udaka Michishige, Tatsushige’s father, who on that occasion was celebrating his 60th birthday. For Tatsushige’s Dōjōji I will have the honor to introduce the event. I look forward to the day with trepidation. With your permission, I’d like to write a small promotion for this event for Japan Travel, a website promoting Japan, its culture and tourism. If you require any information, please email me. That is alright. Thank you for your interest.